I recently upgraded my PRT-TS Wi-Fi thermostat firmware from 1.2 to 1.6 and found that although it seemed to be working in every other way, it was no longer firing up my boiler when calling for heat. To combat this problem, Heatmiser have two sets of firmware – the “A” set for older thermostats and the “B” set for newer thermostats. Unbeknownst to me, I had received version 1.6b when I should have been sent 1.6a. 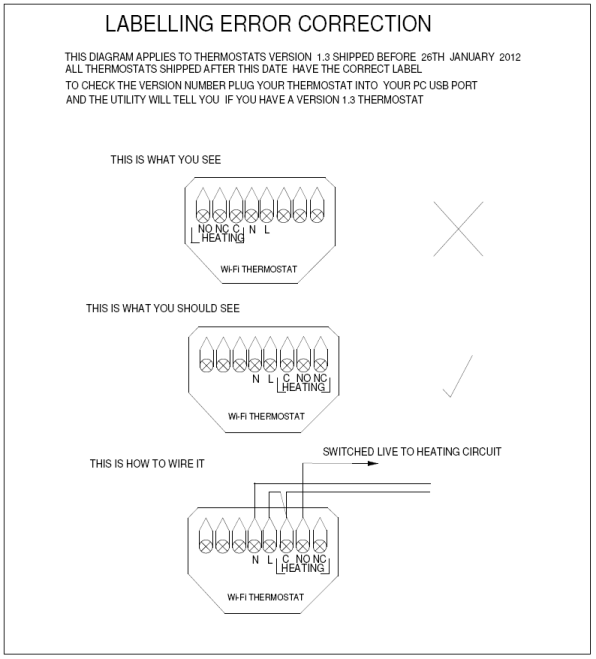 There are two options to fix this – either have Heatmiser send out a programmer with the 1.6a firmware, which would take a few days, or – as I did – simply rewire the thermostat as per the corrected wiring diagram. Obviously I recommend that you hire a qualified electrician to do this if you’re not proficient yourself. Unfortunately it’s not possible to determine which firmware you have been sent until you’ve flashed your thermostat with it, so if you decide to upgrade, I recommend you check the label on the rear of your device and check with Heatmiser that they are sending the correct firmware type (A for the top diagram marked with a cross, B for the middle diagram marked with a tick). This entry was posted in Hints & Tips. Bookmark the permalink. Thank you for sharing this information. Where did you download the 1.6 firmware? I don’t see any firmware updates at http://www.heatmiser.com/index.php/support/manuals-and-documents for the PRT-TS Wifi. You need to contact the Heatmiser sales team and they will send you a programmer loaded with the latest firmware, in exchange for a refundable deposit. Thanks. What do you exactly mean with a programmer, for a refundable deposit? A piece of hardware to update the firmware? Yes, that’s exactly it. Unfortunately you can’t update the firmware via USB or the web interface – you have to use Heatmiser’s special PIC programmer which they’ll send out to you at no charge as long as you return it promptly. Ok, thank you. I’ll contact the support desk / sales team.